She starts with a fairly common-or-garden complaint about the number of invitations to review everything from her Uber driver to sheets from John Lewis and the local McDonalds. She then answers her own unspoken question (why do businesses ask for reviews?) by quoting the Competition and Markets Authority's statistic: that £23 billion of spending is influenced by reviews. She goes further, by saying how useful her husband's research into holiday restaurants is. Then follows the story of Oobah Butler's fake restaurant that made it to number one on TripAdvisor - now we're cooking (forgive the awful pun). "Amazon and TripAdvisor say they can detect frauds." Anyone can set up an account with TripAdvisor - as Oobah Butler did - and write fake reviews, even multiple accounts and multiple fake reviews. We have met businesses who openly admit to commissioning staff or outside agencies to do so (did you know you can even bulk buy 'temporary' email addresses so your fake reviews cannot be tracked?). It is the same with every reviews site on the planet. We have highlighted many examples on these pages over the years. There are sites that are nearly fake-review-proof - but they have other downsides (more on that later - see * below). If reviews - genuine reviews - were not so massively helpful, to both businesses and consumers, we would give up. But they are, so we won't. Wherever possible, read Google reviews. These days they are almost all attached to a real person. Look for reviewers who have posted multiple reviews, or even better, trust Google Local Guides. Focus on Google reviews. 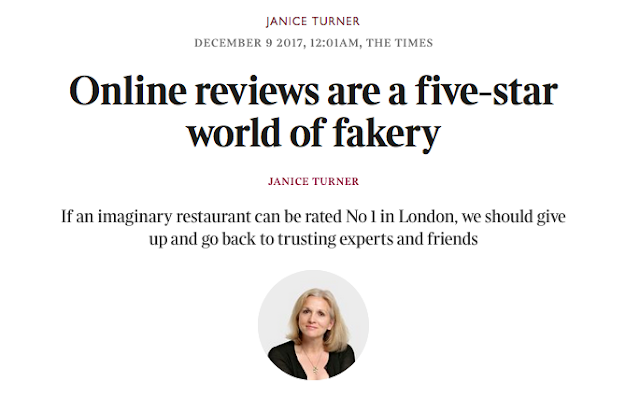 They are so much more visible than any reviews from an independent site and are massively more trusted by consumers (with good reason - see above; and a recent survey by the property portal Rightmove found that consumers trusted Google reviews up to ten times more than those on independent reviews sites). The reward for looking great on Google - more business - is worth the effort. If you are concerned that your customers may harm your business by writing factually incorrect or potentially misleading reviews, and need a mechanism for minimising the chances of that happening, then HelpHound is here for you. * Booking.com and Feefo are two interesting examples: a review can only be written on Booking.com if the reviewer has booked their hotel room through the site - and that works fine, as long as the actual person making the booking agrees with any other guests (partner/tour party) on the gist of their review, because the other parties will not be able to write a review, at least not on Booking.com. Feefo is a variation on this theme, with one major difference: they rely on the business to provide the email addresses - we reckon this works brilliantly for online retail but has significant flaws for more complex transactions and service-related businesses: how many estate agents resist the temptation to leave that stroppy tenant's email address off the list? In the real world this kind of 'cherry-picking' has the effect of making the business look great on the - nigh invisible - reviews site and considerably less great on Google, where everyone sees the negative reviews posted by those who were never invited to write a review on the independent site (for more see here).